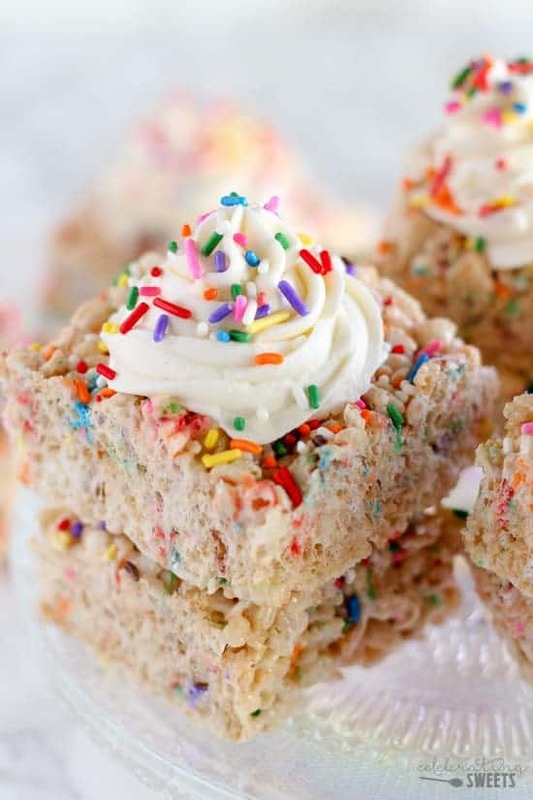 Rice Krispies Treats Recipe – Chewy, gooey Rice Krispies treats filled with colored sprinkles, decorated with vanilla frosting, and topped with more sprinkles! 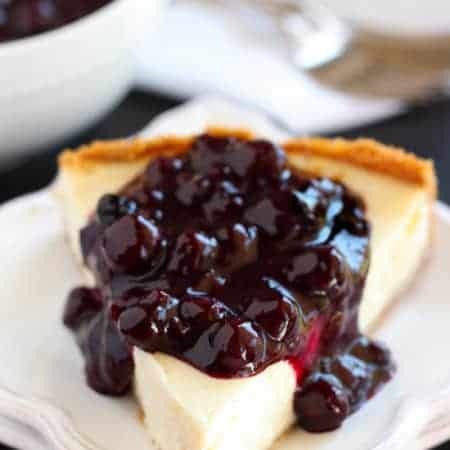 An easy, fun, and festive treat for your next celebration! Today is a big day in our family. Our son, Jake, turns 5! 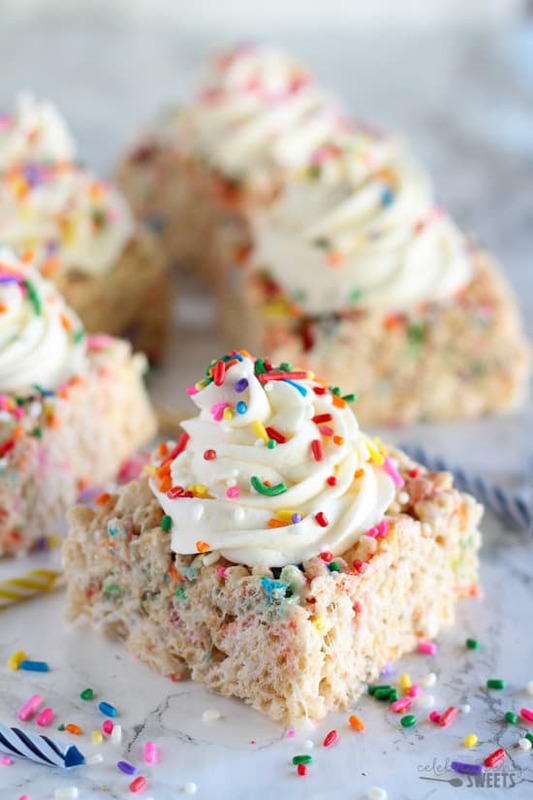 If there was ever a time to share a recipe for Rice Krispies treats loaded with sprinkles and decorated with vanilla frosting, today is the day. My sweet boy only turns 5 once, and I want to celebrate his big day one of the best ways I know how – with sweet treats! Side note: I might be drowning my sorrows in sugar. How is my baby FIVE? Feeling all the feels over here. Jake is lucky enough to enjoy three birthday celebrations this year. For two of his celebrations, we will have birthday cake, but for his party with his friends I decided to skip the cake and make big, thick, sprinkle-filled and frosting-topped Rice Krispies treats. What kid would turn down one of these?! These Rice Krispies treats are chewy and sweet and loaded with gooey marshmallows and colored sprinkles. 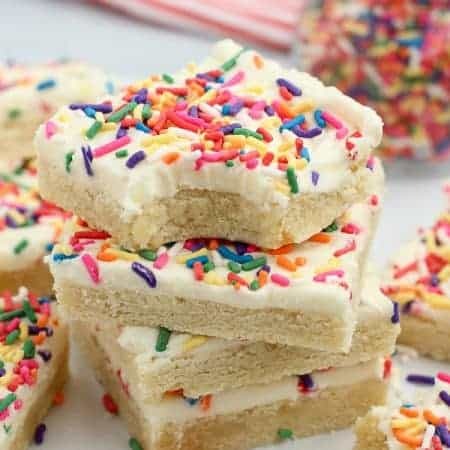 I like to top each of the squares with a swirl of vanilla frosting, but you can also spread the frosting across the whole tray of Rice Krispies treats. 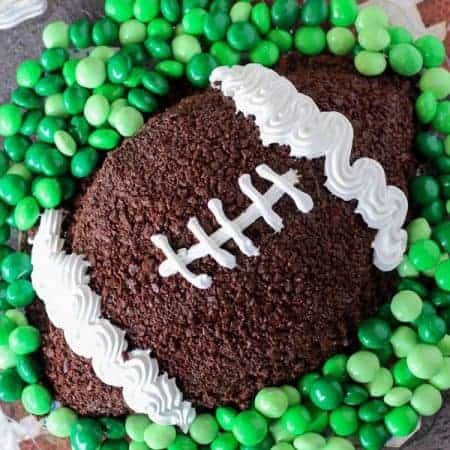 You’ll love serving these at your next birthday party or celebration! Adults and kids will both devour them. 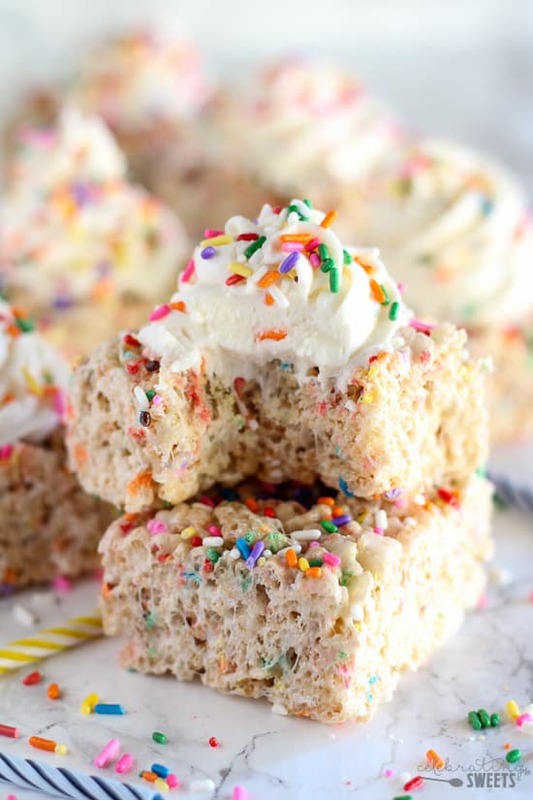 Chewy, gooey Rice Krispies treats filled with colored sprinkles, decorated with vanilla frosting, and topped with more sprinkles! 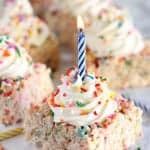 These Birthday Sprinkle Rice Krispies Treats are an easy, fun, and festive treat for your next celebration! In a large saucepan over low heat, melt butter. Add marshmallows and stir continuously until the marshmallows have melted. Remove from the heat and stir in vanilla extract. Immediately stir in Rice Krispies, stirring until well coated. 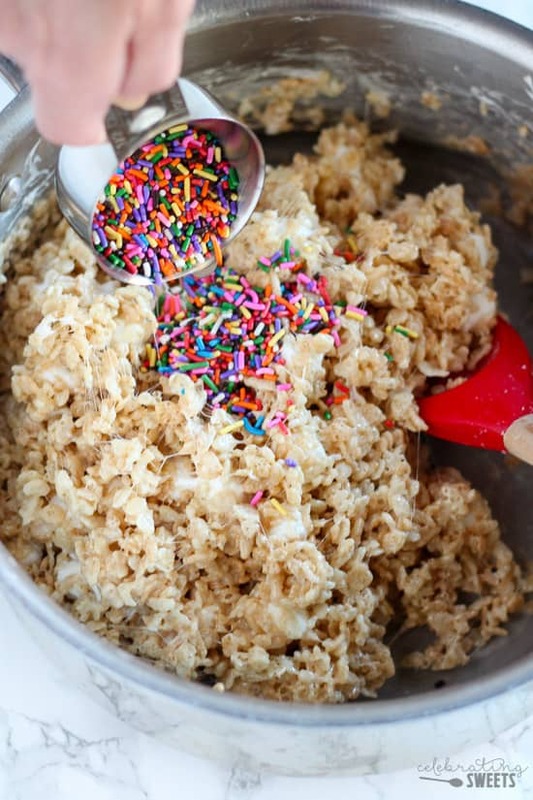 Scatter 1/4 cup of sprinkles over the Rice Krispies and stir just a few times until the sprinkles are dispersed. Do not over-mix or the color from the sprinkles could bleed into the Rice Krispies. Lightly press the mixture into the prepared pan, creating an even layer. Use a piece of waxed paper or buttered fingers to help press the mixture into the pan. Don't press too hard or the treats could get tough. Sprinkle the top with remaining 1 tablespoon of sprinkles. Cool before topping with frosting. Using a hand mixer or stand mixer, beat butter until smooth. Add powdered sugar, vanilla extract, milk, and salt and beat on low speed. Increase to medium-high speed and beat for 1-2 minutes, until creamy and fluffy. Add more milk, if necessary, to thin. Spread the frosting across the top of the bars or use a piping bag fitted with a star tip to pipe frosting onto the top of each bar. Decorate with remaining sprinkles. HAPPY BIRTHDAY JAKE! (what a sweet face!!) I am a big fan of rice krispies and you’ve taken them to a whole new (amazing!) level! I can’t wait to make these!! Char, you are just so kind! Thank you! I will be sure to pass along the Happy Birthday to Jake. 🙂 Take care! What a sweet treat for a sweet kid! WAAAAAY better than cake! I have a serious weakness for Rice Krispie treats and then you went and added sprinkles and frosting!? These babies would never make it to a plate because I’d eat them all straight out of the pan! I’m right there with you, Danae! They are addicting! What a perfect treat for Jake’s 5th birthday!!! (I have a Jake too and it’s been a long time since his 5th birthday party! They grow so very fast.) These confetti treats are just perfect and they say P-A-R-T-Y big time!!!! I hope Jake enjoys all his birthday celebrations and that #5 is the best ever! Enjoy your sweet boy. 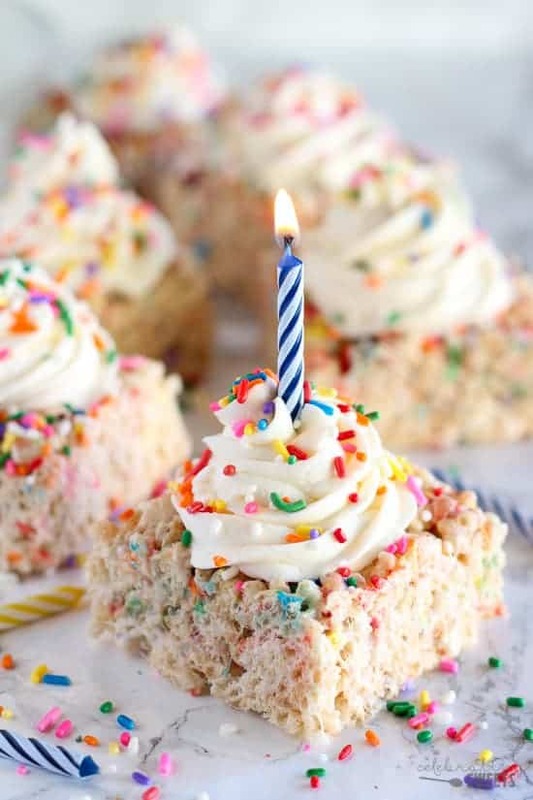 Sprinkles are perfect for any birthday.. and I definitely wish I had one of these Krispie treats now, they look great.